CRIS KOHL and JOAN FORSBERG, well-known maritime historians, scuba divers, authors, lecturers, photographers, and videographers, are a husband-and-wife team who love to explore shipwrecks, particularly those in the Great Lakes. They both have university degrees in History and underwater archaeology certifications from Great Britain's Nautical Archeology Society (NAS). They have been interviewed about shipwrecks many times on television, and their shipwreck video work has been shown on PBS and Canada's CTV. Joan, from Chicago, has been the Chairman of the "Shipwrecks and our Maritime Heritage" Room at Chicago's "Our World -- Underwater" Show since 1996. She is the author of the scuba celebrity cook-and-tell book, Diver's Guide to the Kitchen, and articles in magazines such as Immersed, Great Lakes Boating, and Wreck Diving (for which she is the Copy Editor). In her three terms as President of the Underwater Archaeological Society of Chicago (2008, 2009, 2010), she spearheaded several significant maritime history projects, particularly the sinking of the historic ship named the Buccaneer as the newest shipwreck site off Chicago. She was the recipient of the 2011 UASC Award for her many years of leadership and dedication. Joan was inducted into the international Women Divers Hall of Fame in 2010, was elected Chairman of the Board in 2014, and was re-elected to that position in late 2015. Cris, a prize-winning underwater photographer, is from Windsor, Ontario. A Past President of the Underwater Archaeological Society of Chicago (2004), he has written 14 books and more than 325 articles about Great Lakes shipwrecks published in magazines such as Canada's DIVER magazine and in every issue of the international publication, Wreck Diving Magazine, since it began operations in 2003. He has helped locate and identify many shipwrecks. He is the 2008 recipient of the annual "Our World -- Underwater" Outstanding Achievement Award, and the 2013 Marine Heritage Award from Save Ontario Shipwrecks "for his extensive body of work contributing to widespread appreciation of Ontario's maritime heritage." His popular book, The Great Lakes Diving Guide, is the most comprehensive book ever published about Great Lakes shipwrecks. Authors of the recent books, The Wreck of the GRIFFON, The Greatest Mystery of the Great Lakes and The Christmas Tree Ship, and producers of 16 history documentaries, more than two dozen postcards, and several wreck maps, Cris and Joan are currently working on more shipwreck collaborations. 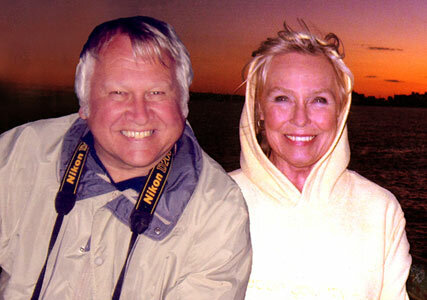 Cris & Joan's web site is Seawolf Communications. 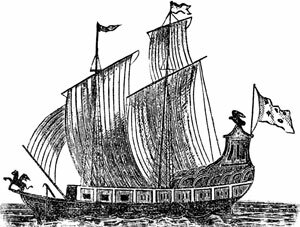 In the year 1679, the first ship to sail on the upper Great Lakes disappeared with its entire crew and valuable cargo of furs. Built by the explorer, La Salle, near Niagara Falls, its loss nearly ruined him. 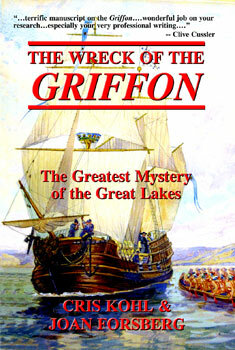 To this day, more than 335 years later, the wreck of the Griffon has not definitively been found. 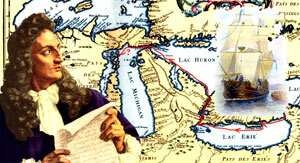 It has become the most hunted – and the most “found” – shipwreck in Great Lakes history. On its maiden voyage, this ship was the very first vessel to sail across Lake Erie, up the Detroit and St. Clair Rivers, and across Lake Huron and Lake Michigan. On its way back to Niagara from Green Bay, it vanished, commencing the centuries-long quest to discover its fate. This multi-media program, based on the intensely researched new book of the same title, relates the fascinating story of the Griffon, and many of the 22 claims of discovery made in the past 200 years, with exciting on-screen visuals, vibrant background music, and dramatic live narration.